Which states’ tax laws widen inequality? Editor’s note: This post originally appeared in the Wall Street Journal’s “Real Time Economics” on May 20, 2015. New research by a trio of Federal Reserve staff economists finds that, on average, state taxes increase income inequality, albeit only slightly. Most of the tax systems impact on income inequality comes through the federal tax code. But—and here’s the most interesting finding—state tax systems vary enormously. In a few states, Minnesota, Oregon and Wisconsin among them, state taxes reinforce the effects of the federal tax code, further shrinking the income gap between rich and poor beyond what federal taxes do. 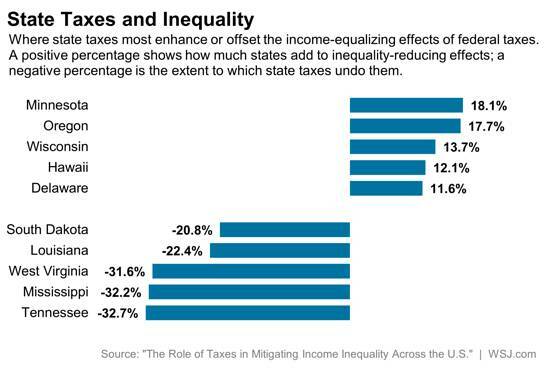 But in others, Tennessee, Mississippi and West Virginia among them, state taxes undo about one-third of the inequality-reducing force of federal taxes. In two of the most populous states, Illinois and Florida, state taxes undo roughly one-sixth of the inequality-reducing effects of federal taxes. States, of course, rely more on sales taxes than the federal government does—and sales taxes in general are more regressive than the federal income tax, which takes more of a bite out those with higher incomes. In comparing states to one another, the economists find that state gasoline taxes tend to widen the income gap. State sales tax exemptions for food and clothing reduce the income gap because lower income families tend to spend a greater fraction of their income on food and clothing than the rich. State earned-income tax credits—which supplement the federal EITC to provide tax breaks and, sometimes, cash to low-wage workers—reduce inequality. The working paper by Daniel Cooper of the Federal Reserve Bank of Boston and Byron Lutz and Michael Palumbo of the Federal Reserve Board in Washington, presented at a recent National Tax Association conference, finds that over the past 30 years, the inequality-reducing effects of combined federal and state taxes have grown significantly. About two-thirds of that is due to the federal tax system and the rest to changes in state taxes. The research, based on data from 1984 to 2011, looks at the effect of taxes on the distance between the incomes of those at the 10th percentile (those whose incomes are below 90% of the population) and the 90th percentile (those whose incomes are above 90% of the population). It doesn’t consider the impact of taxes on the very rich, the top 1%. Their research shows the degree to which taxes in each state and the District of Columbia offset the inequality-reducing effect of federal taxes or enhance it.